Plot 2 is almost ready for planting. We just need some dirt and then cleared space for potatoes and artichokes. The 2018 growing season has started with some light work, namely putting some peat moss on the asparagus bed. It popped up about the first of April in 2017. We were too busy harvesting and preserving to take any pictures. That's my story, and I'm sticking to it. The first freeze of 2017 was Saturday, 10 November. On Sunday I pulled all the plants, aggressively trimmed the grapes and berries, pulled up the mats, and made a pass with the tiller. Plot 1 is *almost* ready for winter. The growth between 11 Jun and today is amazing! 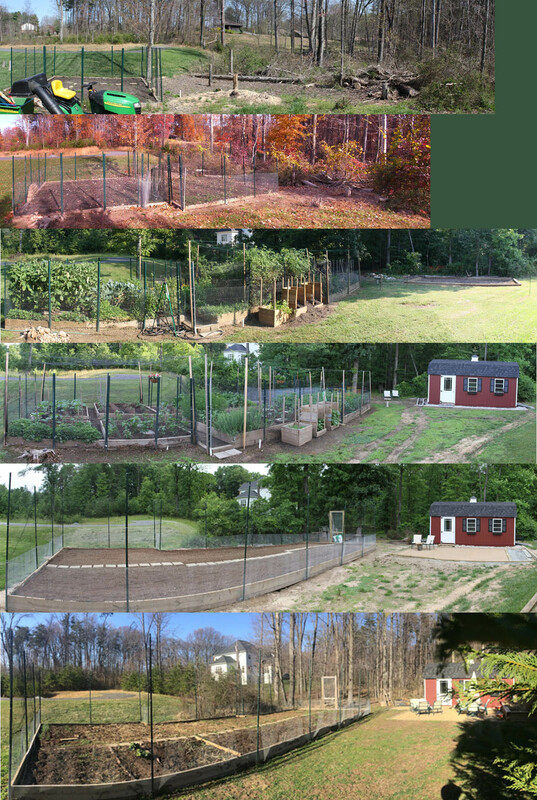 So much happened in 3 weeks - in life and in the garden. Hard to believe how fast things change. Finally a respite from the rain. All of the seedlings have been moved to the garden and the sprinkler set up (with a moisture sensor!) to keep them happy until we can finish preparing the soil, laying out the mats, and building some boxes. All of the topsoil, mulch, and stone dust has been moved. The south side of the fence is back up, cleaned and stapled across the bottom. 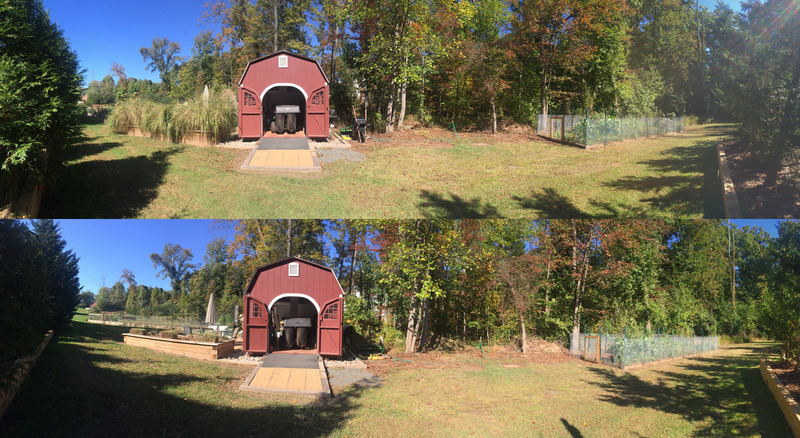 The future east patio has been leveled and tamped, and one set of shelves put up. How did I have dozens of 12" braces but only 6 of the 16" braces?! is 4 tons of stone dust. We're thinking about putting pavers on the right side to tidy up the tow-behinds and tools. 20 Feb 2017 - The soil is tilled, the grapes and berries trimmed (hacked?). Outside the fence on the left is garlic; inside the fence (under the garden mat) is spring peas. 5 Feb 2017 - Garlic has sprouted, but it still feels like spring is far, far away. 27 Dec 2016 - Mother Nature gave us one more "warm" day to finish some cleanup. Asparagus prepped, boxes disassembled, peas sewn, but too wet to till. 30 Oct 2016 - Another summer went by far faster than we can appreciate it. On 10/30, peppers were still in the ground (left) and the asparagus bed wasn't ready to prep (back right). 16 Jul 2016 - Growth is really ramping up now. We usually hit peak at the end of August - 6 weeks away. 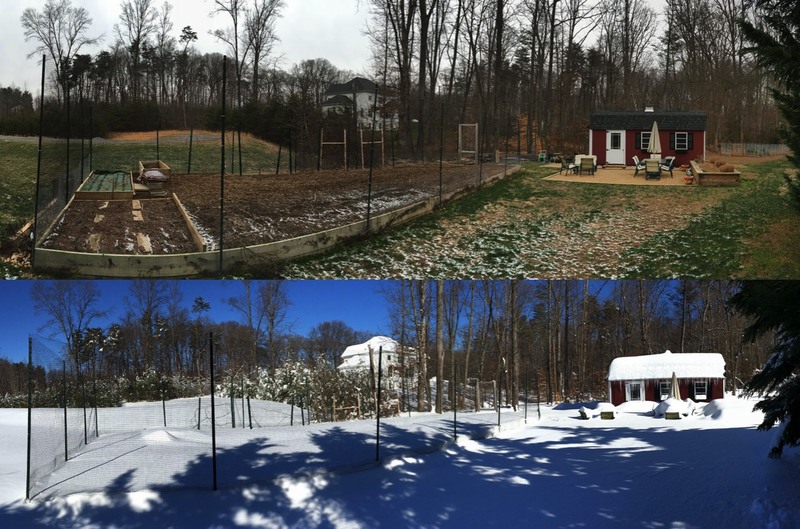 9 May 2016 - Quite a difference in 42 days! 27 Mar 2016 - 42 days until Last Frost, 20 yards of top soil moved. 3 Jan 2016 - 6 weeks closer to spring! 15 Nov 2015 - Prepared for Winter Rest. Garlic, onion, shallots, asparagus, rhubarb, grapes, and blackberries stay in the ground. We pulled the strawberries and will take care of them in pots overwinter. 31 Jul 2015 - I’d say that pumpkin is…oh…25% bigger than on the 18th! Lots of work to do this weekend. 18 Jul 2015 - Yes, as a matter of fact that pumpkin DID go from zero to 20+ pounds in less than 3 weeks! 28 Jun 2015 - After a weekend of really hard work! 16 Jun 2015 - Now we’re growing! 1 Jun 2015 - As the plants grow, so too do the weeds. 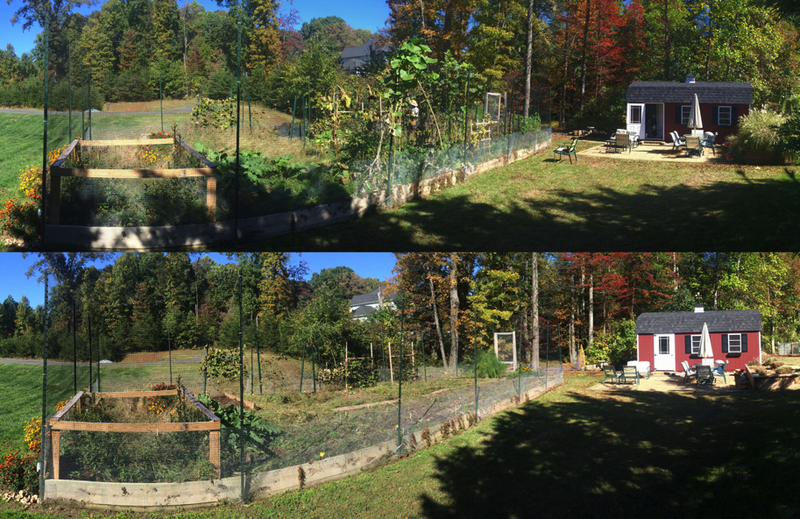 25 May 2015 - Now with a Strawberry Fortress! 9-10 May 2015 - Most plants are in the ground. 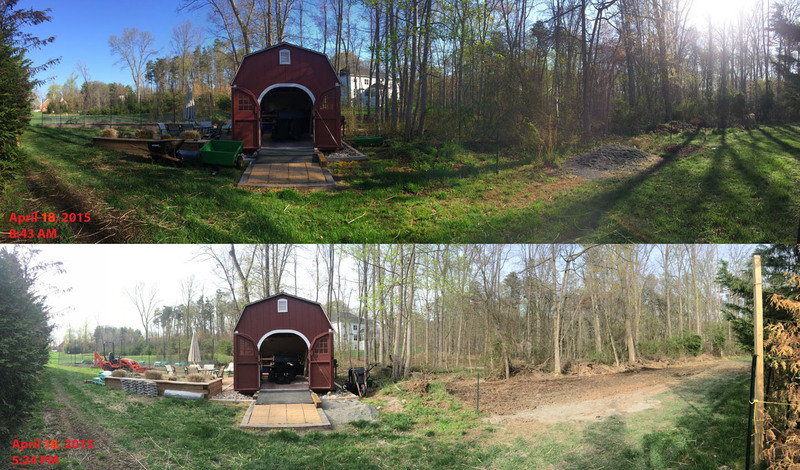 25 Apr 2015 - Now we have two plots to tend. 18 Apr 2015 - A beautiful and productive spring day! 5 Apr 2015 - Fences repaired, some weeds pulled, the rest given a good drink of RoundUp. 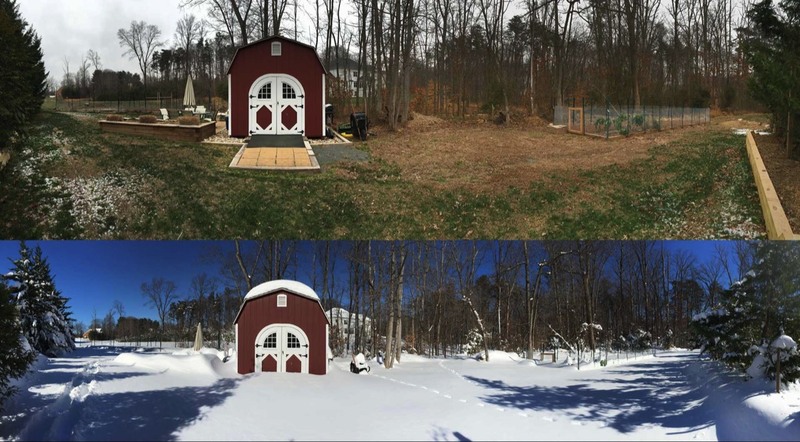 17 Feb 2015 - Winter is not done with us yet. 24 Jan 2015 - Wet but not white. At least not until Monday. 6 Jan 2015 - I spoke too soon. 4 Jan 2015 - Change is as slow in the winter as it is rapid in the spring. 14 Dec 2014 - After the cleanup yesterday. 13 Dec 2014 - This is BEFORE the day’s fall cleanup. We’re keeping the strawberries, rhubarb, and asparagus for 2015. 29 Aug 2013 - We must be near the peak! 28 May 2013 - Fence, Door, Patio - Progress!